In the regular ed classroom, Morning Meeting was always my very FAVORITE part of the day, and most of my students shared this sentiment. During Morning Meeting, I connected with my students AND they connected with each other on a personal level more than any other time of the day. Not only did I feel like I feel like our classroom community was nurtured and refreshed, I felt that the “positive vibes” during Morning Meeting set the tone of mutual respect for our entire school day. The truth is, every child, every day needs to feel valued and included. The long term benefits of Morning Meeting make the 20-30 minutes per day well worth your time! I’ve seen several variations of Morning Meeting, some that are entirely focused on building social/emotional skills, some that are heavily focused on academics (often involving calendar and math skills), and some that involve a little bit of both. My favorite model of Morning Meeting is from the Responsive Classroom program and is almost entirely devoted to social and emotional development, but easy to incorporate academic review as well. According to the Responsive Classroom philosophy, the social/emotional curriculum is just as (or even more) important than the academic curriculum. My favorite Responsive Classroom resources are The Morning Meeting Book and The First Six Weeks of School. Quite honestly, they changed my ENTIRE classroom philosophy, guiding me to build the ideal classroom community of learners! Click below to learn more about the Responsive Classroom program! You might be wondering (as I did) why Morning Meeting might be worth your time. Like you, my instructional minutes were already packed as tightly as possible. How on Earth could I devote 20-30 minutes per day to One. More. Thing?! Well, it takes some flexibility and careful planning for sure, but the truth is, more and more students are entering our classrooms each year with a significant lack of social skills, leading to a continual increase of behavioral problems and social conflicts…ALL of which INTERRUPT our instructional time on a regular basis. It’s an unfortunate reality that so many children do NOT learn or practice social and emotional skills in their homes, and the responsibility is ours to ensure that we are sending students into the world as models of citizenship and character. I promise you, Morning Meeting is a pivotal tool that will PREVENT behavioral issues, allowing you to devote even more time to academic instruction. First things first, click below to download your FREE Morning Meeting templates and display poster! I’ve seen teachers do the Message either at the very beginning of Morning Meeting or at the very end. I always did mine at the end, for reasons that I’ll discuss below, but it’s really a matter of personal preference. Students are usually seated in a circle for morning meeting, either on the carpet or in chairs. I also find it helpful to have a classroom job called the “Morning Meeting Master,” and that student is responsible for beginning the greeting for the duration of the week. As students gain mastery and control over Morning Meeting, I will allow the Morning Meeting Master to choose the greeting each day. Also, it is important to promote an atmosphere of kindness and respect for others during Morning Meeting, emphasizing that there will be a time for silly greetings, but self-control is still expected. The Greeting Cards pictured above can be purchased in my TpT store. The package includes 32 of my favorite greetings, along with editable greeting cards for you to add your own! The Activity or Game is usually the students’ favorite part of Morning Meeting. Why?! Because it’s so much fun! Responsive Classroom activities and games are intended to introduce, practice, and establish a classroom community of respect and trust. The ultimate goal is a gradual release of teacher responsibility, with a focus on student-led decisions and control. Through activities and games, students gain self-discipline, confidence, communication and social skills, empathy, respect for others, and a sense of belongings. Students must be specifically taught expectations and given ample time to practice them. In order for the activities to become student-led, they must be repeated regularly. The first six weeks of school is the ideal time frame to introduce and practice expectations for activities and games. This is also the time for teachers to model procedures, lay “ground rules,” and deal with behavioral issues in a proactive manner. Specific skills to model and practice with students include cooperation, self-control, sharing, taking turns, listening skills, following directions, sportsmanship, mindfulness, metacognition, and basic social skills. The Morning Meeting Activities and Games cards pictured above are also available in my store, containing 85 favorite songs, activities, and games. They are color-coded for the beginning, middle, and end of the year and also include editable cards for you to add your own! The Message, as shown in the example above, gives students a “preview” of their day to come, including major lesson objectives and special events. Children LOVE to know what to expect, and the Message is a simply way to give them a quick summary. I always add a challenge, review or website link at the very end that leads into our first lesson of the day. In the example, the prompt at the end would lead directly into a whole class mini-lesson on adjectives. Morning Messages can also be handwritten on chart paper or large dry erase boards. Giving that I have zero patience for handwriting ANYTHING, I always type mine to project on our Interactive Whiteboard. CLICK HERE FOR MONTHLY MORNING MESSAGE TEMPLATES!!! I hope these tips might encourage you to give Morning Meeting a try in your classroom! The benefits are truly limitless for both you and your students. Thank you so much, Reagan! I taught 5 years without RC and have now used it for the past 7 years, and I don't know what I ever did without it! 🙂 The impact on my students has been unmatched. Loved reading the positive stories about your students! I love this!! Morning Meeting is one of my 4th graders favorite part of each day, too. When they become 5th graders, they always come back saying how much they miss it! I LOVE this! Where would I get a copy of your template that you use on the interactive whiteboard? I see it says you use powerpoint for that… I would love to have the template to use in my classroom! Thanks and I appreciate your tips and advice! Love your site!! Hi Kari! I'd be happy to email you this template! 🙂 What is your email?? I would really appreciate this template as well! I’m sorry, but I no longer have the template pictured. 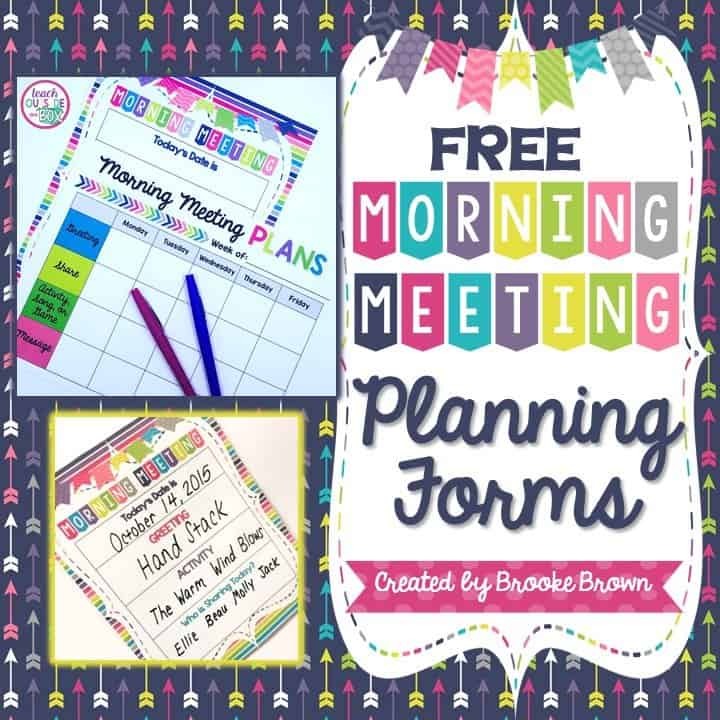 I do have monthly themed editable Morning Meeting PowerPoint templates in my TpT store (Brooke Brown) along with many other Morning Meeting resources. Thank you! Thank you for you encouraging tales of morning meeting. I teach sixth grade and it is a favorite part of my student’s day as well. Share time has been a thorn in my side though because it takes up the whole meeting. I think I will take the idea of only have a couple share each day thereby limiting the time it takes. I am still collecting game and activity ideas. I’m just starting the morning meeting in my preschool classroom. Where can I get the templates and more info? Kindly send me the details to may mail id: brupashree81@gmail.com. Thanks for sharing this great idea. I’m teaching summer school for the first time and want to do a morning meeting. I would love to have your PowerPoint if you don’t mind. My email is bettykouts4@gmail.com. Thanks so much. I have done morning meetings in the past but nothing as laid out as this. This last year I have been in a new school and the bullying was unreal. I am determined to make my class next year better. I love this layout. I am moving from 3rd to 5th. Could you send me the template also. I need all the help I can get. Hi Daniela! All of my Morning Meeting materials are now available for purchase in my TpT Store (Brooke Brown). You can view all the options there. 🙂 Thank you so much for visiting my site! I have been really looking for resources to start Morning Merying this year with my 4th graders. I am so excited you have all of these resources ready to use. Thank you for your awesome, well laid-out posts to help me better understand the benefits of using the RC system. I am off to buy the book! Thanks for always having beneficial posts! I agree that this morning time is so important. I use it to start the day off positively by sharing good things as part of Capturing Kids Hearts. But I think I could take it further by encorporating some of your ideas. Thanks for this great resource! ones. They get so self conscious and need those appropriate social skills! Would this program be suitable for first graders? How much time do you allow for your morning meeting? I’m wanting to try this with my first graders this year! Awesome! Thank you for sharing! I will be purchasing your items inTPT, but would mind emailing me the PowerPoint templates? Hi Brandi! I’m sorry but I no longer have access to the background I used in this blog post. Themed PowerPoint templates for every month are in my store.